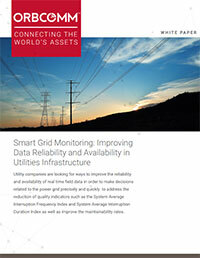 Utility companies are looking for ways to improve the reliability and availability of real time field data in order to make smarter decisions related to power distribution. The ability to precisely and quickly address warning signs related to quality indicators such as the SAIFI (System Average Interruption Frequency Index) and SAIDI (System Average Interruption Duration Index) is key to improving the integrity and reliability of smart grid infrastructure. Traditional connectivity options, such as radio or cellular service, are susceptible to both environmental and network capacity driven outages. Most of the time these options work well, however it is precisely during these outages when utilities need to understand how their electrical distribution network is functioning. The evolution of satellite, particularly in telemetry applications, has made Smart Grid monitoring an accessible and reliable reality for M2M (Machine-to-Machine) applications. These satellite-based solutions are designed to process data collected from devices installed in the power grid to enable command, control and telemetry. Satellite telemetry devices can be customized to control the process of information exchange between the Distribution Operations Center (DOCs) and the field protection equipment. DNP 3.0-enabled devices can be integrated with power grid protection devices such as reclosers, capacitor banks and voltage regulators, as well as with measurement devices such as Smart Meters, allowing the reliable exchange of field information in real time. A dual-mode cellular/satellite solution uses satellite as the secondary, backup mode of connectivity. ORBCOMM’s satellite telemetry device is the link among the areas where cellular coverage is completely unavailable. For example, in connecting reclosers, event and alarm messages may be sent, including analog and digital values which represent recloser status information. These values are filtered and the relevant data is transmitted by the solution, ensuring minimal network data usage. By analyzing this information, the DOC is able to improve Smart Grid quality by responding with recloser control requests. Reinaldo Burian is ORBCOMM’s Application Engineer for Smart Grid. For more information, visit http://www.orbcomm.com.